An unhinged and unsettling examination of reality, 12 Monkeys is a warped vision of what may go on within the overwhelmed human mind. That this journey into the brain is told within a context of a gripping science fiction tale of time travel is a triumph for director Terry Gilliam and screenwriters David and Janet Peoples. Around 1997, 5 billion people are wiped out by a virus. The survivors re-establish an underground human society, away from the contaminated surface, now ruled by wild beasts. Many years past this future, James Cole (Bruce Willis) is a prisoner held among the sub-surface humans. He volunteers for a time travel mission to journey back to 1996 and uncover the source of the virus, to aid in the creation of an antidote. 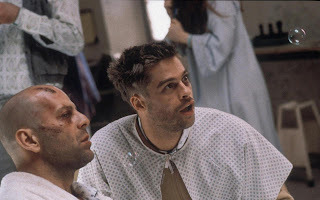 His first trip mistakenly lands him in Baltimore of 1990, and he is immediately thrown into a mental institution where he meets the genuinely mad Jeffrey Goines (Brad Pitt) and sympathetic psychiatrist Dr. Kathryn Railly (Madeleine Stowe). Another trip in time finds Cole landing briefly in the midst of a World War I battle, where he gets shot, before he re-emerges in Baltimore of 1996, kidnaps Railly and sets off to uncover the perpetrators who unleashed the virus. His search leads him to Pittsburgh, and an activist group calling themselves 12 Monkeys, intent on combating cruelty to animals being conducted in the name of scientific research. 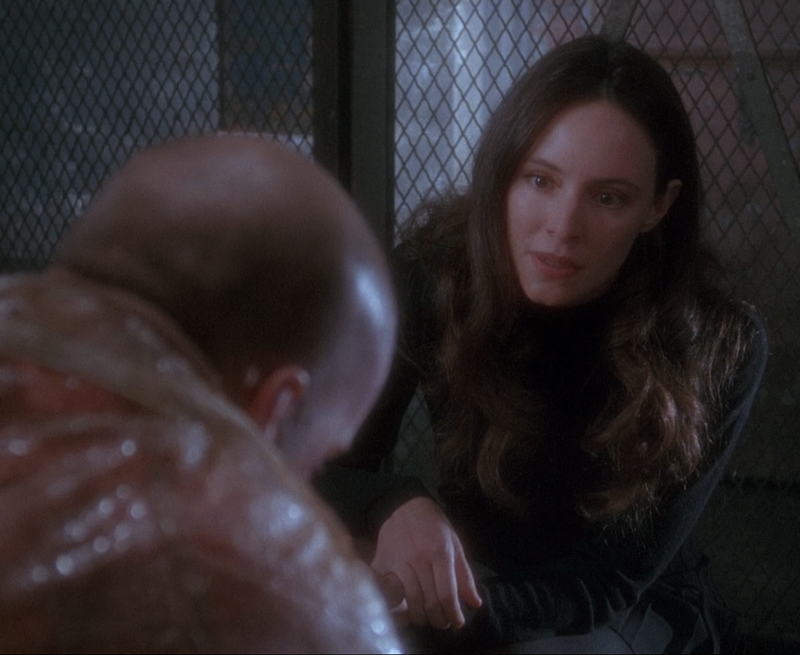 The leader of the 12 Monkeys is Jeffrey Goines, released from the mental hospital but still much less than balanced, and whose father (Christopher Plummer) runs a virology lab. Cole makes one more trip back and forth in time, and just when Railly starts to believe his story that humanity is about to be destroyed, Cole starts to lose touch with what is real and what is a hallucination. Gilliam infuses 12 Monkeys with a memorable array of colours, angles and gadgets. The subterranean, post-annihilation world recalls a Mad Max-in-confinement aesthetic, with desperate scientists cobbling together gizmos to try and reclaim the stature of the human race on the surface of the planet. Gilliam colours these scenes brown and yellow, symbolizing the bowels of the earth. The surface scenes with Cole racing to find the origins of the virus have a blue-white hue, a mix of the institutional and artificial. Throughout, Gilliam plays with his camera angles, sometimes to distraction, such that Cole rarely has a moment of serenity or comfort: everything is coming at him with a leading edge. Brad Pitt stole all the headlines with his performance as the deranged Jeffrey, and he does demand attention: a source of fragmented but high intensity energy, at no point is any part of his body or brain at rest, and often many his body parts are moving in different directions as he recounts his version of what he believes to be the truth. Bruce Willis gets the role with the slower path to madness, starting out as a prisoner in his present underground world, getting to grips with a past world, but gradually losing the defining line between certainty and imagination. Willis pulls off the role with anguished authority, his bravado melting into self-doubt the more he zips back and forth across forbidden dimensions. Madeleine Stowe is not immune to all the confusion, but although her Dr. Railly is in a better position to understand the brain's ability to twist itself, she ironically finds herself believing Cole's fantastic story of time travel and 5 billion deaths just as he starts to doubt it. The role reversal is a magical moment in 12 Monkeys, the two central characters exchanging positions but tragically not meeting on common ground until it's too late. Stowe delivers a performance that deepens the mystery surrounding the relatively low key level of stardom achieved during her career. Cole's travel between time zones, and his increasing confusion about what is real, questions the definition of certainty from various perspectives of time and space. Gilliam gradually leads the film to its disquieting conclusion: none of the worlds that Cole inhabits are universally "real"; the current context of the beholder defines only the immediate truth. One of the final scenes zooms deep into the eyes of a young James Cole, witnessing just one tragic reality that is already warped, except that he does not know it. 12 Monkeys is fine science fiction: thoughtful, thought-provoking, entertaining, and delivered with conviction and swagger.